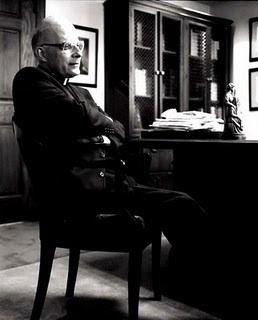 First, it was Father Jenkins openly defying the United States Council of Catholic Bishops (of which Chicago's Cardinal Francis George is president) by letting our 100% pro-abortion President of the United States, Barack Obama, give the commencement speech and being awarded an "honorary" degree from the country's "flagship Catholic university," the University of Notre Dame. Second, it was Cardinal George awarding his controversial priest, Father Michael "Flim-Flam" Pfleger, a Lifetime Achievement Award shortly after Rev. Pfleger denounced the Catholic doctrine of the priesthood during his Easter Sunday sermon. And, after these disasterous doctrinal abuses, it's time the Catholic Special Forces take charge and say there will be no number three. Well, time has passed, but if times have changed for George, Pfleger's flamboyant disobedience has remained the same. First, when the Cardinal was about to transfer Pfleger to another parish (which is the Archdiocese's practice for every Chicago priest after a set number of years) Pfleger threatened a full scale St. Sabina revolt, and George backed down, leaving Mike the Maniac his "bully" pulpit. Next, when Pfleger invited the Rev. Al Sharpton, a notorious pro-abort, to sermonize at St. Sabina, George publicly expressed dismay, but said, "it would be a waste of effort to try to dissuade him." George finally did mildly rebuke Michael after he openly mocked Hillary Clinton (and just as openly endorsed then Sen. Obama) when he guest-ranted for the Rev.Wright at Jeremiah's house of pain and worship, but after delivering a mild "mia culpa" and serving a brief two week suspension from preaching, Pfleger was back in the saddle at Sabina's as powerful as ever. Finally, while George did schedule Pfleger's dubious award (for his active opposition to gangs, drugs and guns) well in advance of Father's Bloody Easter Sunday sermon, it would be hard to not find the fact that this Martin Luther of the South Side received the award just days after his maniacal manifesto ironic, and George's subsequent silence on the subject deafening. Speaking of time, the time for half-hearted, half-assed Pfleger apologies is over. George and the Catholic hierarchy are finally coming to terms with sexual abuse, but doctrinal abuse, the sin against Truth that Pfleger and his phonies have committed (and which George has permitted) has the potential to be far worse. By stating on that fateful Easter Sunday that "I don't need a bishop, I don't need the Cardinal, I don't need the Pope," and then apparently contradicting himself (unless Pfleger also now considers himself to be God) by stating the Church needs women (and married) bishops and cardinals, Pfleger is now sowing discord in the house of God, disunity during the Eucharist, the "Sacrament of Unity," with disasterous results. While the Catholic Church teaches that the Eucharist is "the source and summit of our Christian life" (CCC 1324), and that "unless you eat the flesh of the Son of Man and drink his blood, you have no life within you" (John 6:53), it also states that those who "despise the church of God...eats the bread or drinks the cup of the word in an unworthy manner" and is not only "guilty of sinning" but "eats and drinks a judgment on himself" which can lead to sickness and even death (1Cor.11:22, 27-30). By urging his flock along this dark path, Pfleger is not fighting on the side of Saint Michael, but with the legions of the fallen angel whom his namesake fought against. Thus, this time George has no choice. He must remove Pfleger from the rank of active ministry immediately. If I were George, I would also urge Pfleger to leave the priesthhood, and then find a church more compatible with his beliefs. Maybe Rev. Wright's (and Barack Obama's) fomer church would consider him, or Pfleger could start his own denomination, the First Church of the Aging Egomaniac. Then George must deliver next Sunday's sermon at St. Sabina's himself, correcting point by point each of Pfleger's many Easter errors. But I know what you're thinking. George, despite talking a good talk, has, when it comes to action, proved to be more of a Pollyanna than a Polycarp--and he won't dispose Pfleger until hell freezes over (with apologies to The Eagles). So it's time to call the police--the Catholic Special Forces. Similiar to the special forces in Chicago where policemen infiltrate gangs to locate (and bust) the gang leaders, the CSF would gather information, stake out certain locations, then burst in when the search for Truth is found wanting, nabbing the guilty padre not for heroin, but heresy. I know some Windy City policemen with families who might consider it; honest Catholic cops who expect a holy homily when they get a Sunday off to worship. Of course, finding a free and fearless Father to replace the imposter could initially prove to be difficult. Until an order of courageous paratrooper priests are approved (perhaps the Kolbians after St. Maximilian?) the CSF might also have to be traffic cops, directing the congregation to the parish with the nearest faithful pastor until the false prophet can be replaced. But if the main goal of the CSF is to get the people to a good priest, we still have to figure out what to do with the bad ones. While your guess is probably the same as mine as to where these ordained criminals will go in the long run, the short term solution seems to be Washington. 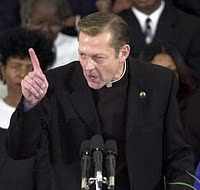 Not only does President Obama appear to have a bottomless need for pseudo-Catholics who will sell their soul for a senator's seat, a cabinet post or a place on the Death Panel, but the capital is truly the place where Flim-Flam Pfleger would be preaching to the choir. Interesting. Cardinal George does have a reputation for being orthodox. Start acting like a man. Rarely has a piece of such good advice been so widely ignored.